Michel Gauquelin & "Mars Effect"
Aquamoonlight Astrology was first launched in 2003 under an Aries Sun. As the sun moves into the zodiac sign of Aries at the time of the Spring Equinox, so begins the astrological new year. This is a time for new beginnings, and so, one year on in 2004, Aquamoonlight Astrology had another new beginning. This time onto its own domain and completely redesigned. Details of what can be found on the Aquamoonlight website and where, are given below. To help those new to astrology there is an Introduction to Astrology that gives help on where to get a birthchart. There is also an Explanation of a birthchart with a detailed illustration. Not too sure where to start? Climb aboard the spaceship to be taken on a journey through the galaxy of astrology. Just click on the spaceship to begin and click on it at the end of each page to be taken to the next dimension. No passport required! There are several free astrological resources on site for online chart calculation, a table of new and full moon dates, times and zodiac signs, along with details of the equinoxes and solstices for 2007. There are also blank charts that you may print out to use however you wish. The links for all of these are to the left of this page under Resources. Basic Astrology - this section of links (left side of page) covers all the areas needed to begin learning about real astrology. From the main Signs page, each individual zodiac sign has its own page. Likewise with the Planets, Houses and Nodes. The link for Systems describes various house systems used in drawing up birthcharts. The Ascendant, also known as the Rising Sign is explained. On the Aspects page all the major aspects, and many of the minor aspects are described with illustrations. There are links from that page to Aspect Patterns with illustrations of the Kite, Mystic Triangle, Grand Trine, Grand Square, and the Yod or Finger of God or Finger of Fate. The link for Nodes covers both the North and South Node. The Elements page has information about the four elements of Fire, Earth, Air and Water. The Qualities page explains the three qualities or quadruplicities of Cardinal, Fixed and Mutable signs. The Glyphs page has images of all the common symbols or glyphs used in astrology. Advanced Astrology - this section of links covers the next step on from basic astrology. Advanced techniques that can be used such as Transits of planets and additional astrological bodies of the Asteroids and Fixed Stars. Included are hypothetical points used such as the Arabic Parts, the Dark Moon (also known as Lilith), and Midpoints. The Solar Return when the sun returns to its natal position on or around the birthday, and likewise the Lunar Return. Eclipses and how they affect a natal chart. Advancing the chart in time by the use of Progressions, moving home and Relocation charts. Rectification gives some ideas on how to rectify an unknown or uncertain birth time. Other Astrology - This section covers other uses of charts. Horary Astrology is the asking of a question and setting a chart for the time and date of the birth of that question. The page includes tables of Essential Dignities and other matters concerning the strength of planets. Electional Astrology is the setting of a chart for a time in the future where the planets are most favourable for an event to take place. Mundane Astrology is the astrology of countries, otherwise known as Political Astrology. The Medical Astrology section gives information about decumbiture charts which are used to help with diagnosis and treatment of illnesses. Included here are tables of diseases, their sign and planetary rulers. AstroCartoGraphy is the plotting of the planets onto a map of the world and seeing where hot spots of planetary activity occur. Relationship Astrology - This section deals with Family relationships between parent and child, between siblings, or any other relative. Synastry is the comparison of two people's birthcharts, while Composite charts are a combination of two charts by the use of midpoints. Birth Twins are those born on the same day and year as ourselves. A list of online databases is included. Free Services - This section has various miscellaneous links as well as those to a detailed list of Free Astrology Programs and other freeware. Astrology Searches lists online astrological search engines. Celebrity birth data is a list of online databases of the birth details of famous people. Free Charts are online resources for computing your birthchart. Free E-Cards are online greetings cards for you to send to your friends. The Links page has lots of useful links to other astrology websites categorised by topic, although many such links will be found on the relevant page of the site. Trying to find something specific about astrology? Try the site search. The index database is automatically updated so that any new additions are always included. 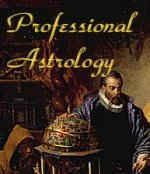 The Glossary may be of help for definitions of astrology in general and also of astrological terms. Links for these facilities can be found at the end of each page.